Marks and Spencer have brought out a new range of low fat Count on Us… cooking sauces. 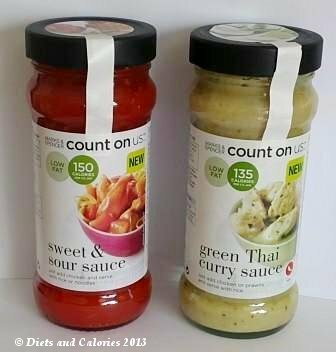 There are three varieties at the time of writing which are: Green Thai Curry Sauce (270 calories), Sweet & Sour Sauce (300 calories), and Jalfrezi (200 calories) - calories are per jar. Knowing Marks & Spencer produce some of the finest tasting ready meals, I was interested to see whether their cooking sauce could produce similar results. I purchased the Green Thai Curry sauces (see below). Cooking sauces are a handy store cupboard standby as they save on preparation time while producing authentic meals in minutes. However, having bought many brands of cooking sauces over the years, I’ve found the results can be a bit hit and miss. The Green Thai Curry sauce is described as a 'low fat aromatic curry sauce with green peppers, lime, coconut milk and chilli.' It's given a chilli rating of mild (I can't buy anything stronger as it'd be too hot for my youngest child). Preparing the Thai Green Curry couldn't have been easier. Step 3: Cook on medium heat for 10-15 minutes until piping hot. The serving suggestion is to sprinkle with chopped coriander, add a teaspoon of fish sauce and serve with rice. The sauce started off nice and creamy, with a lovely rich colour and authentic smell. However, once it had been cooking for a while, it became noticeably thinner. After 10 minutes of cooking, the sauce was quite runny. If I left it like that, I'd end up tipping most of the sauce away to avoid it filling up the serving plates. Rather than waste it, I decided to reduce the sauce to a thicker consistency by simmering with the lid off for a further 15 minutes. The overall verdict given by the family was a thumbs up. They all loved it and would be happy to have it again. As for myself, it didn't quite live up to my expectations. There was something missing and after re reading the instructions I realised I hadn't added any extra coriander or fish sauce. In hindsight, I'm sure the fish sauce would have made all the difference. Of course that end bit is optional but I think next time that's what I'll do. You can find these 350g sauces in M&S food stores. Nutrition information per half jar (175g): 135 calories, 4 Weight watchers ProPoints, 3.3g protein, 18.9g carbs, 7.4g sugars, 4.7g fat, 3.5g saturates, 1.8g fibre, 1.18g salt.